The human rights commission said they are investigating the existence of yet another bus in the case of the disappeared 43 students. 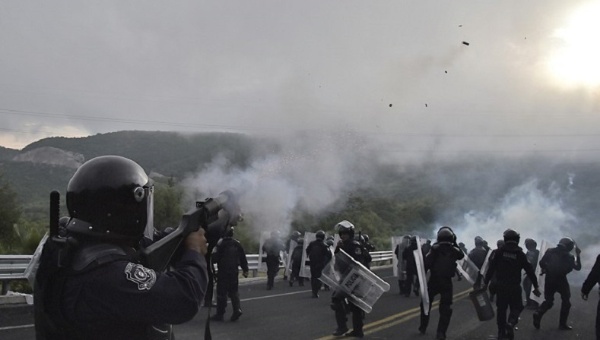 After news of a fifth bus created controversy and further suspicion of a government cover-up, Mexico’s human rights commission has now mentioned the existence of a sixth bus on the tragic night of Sept. 26, 2014, when police went on a violent rampage to prevent buses from leaving Iguala, killing six people and forcibly disappearing 43 students from the Ayotzinapa teacher training college, whose fate is yet to be known. The head of the CNDH human rights commission, Luis Raul Gonzalez, said they are developing a new line of investigation that involves a sixth bus. However, he gave no further details as to who was on board this bus or what happened to it. The statement comes after experts from the Inter-American Commission for Human Rights revealed the existence of a fifth bus. They also exposed a drug element, which they said would explain the violent nature of the attack on students and others more than a year ago in Iguala, a city in the southern state of Guerrero. The international experts explained that while the fifth bus had been detained by federal police, its existence was erased from all attorney general’s office files, which prompted investigators to ask the Mexican government to inquire into whether the bus was transporting drugs. Gonzalez’s statements came after he met with the Mexican Senate Human Rights Committee to discuss the Ayotzinapa case, as well as the situation of jail supervision in the country. The ombudsman told senators that the CNDH had asked the office of the attorney general to expand its interrogations to army personnel and other police officers. However, the government and the Ministry of Defence rejected the idea of soldiers being questioned regarding Ayotzinapa.